Former lawyer Nicole Fitzhenry-Dawes knows she’ll eventually have to either remove the former from in front of lawyer or embrace a new life making maple syrup full-time. Problem is she’s not sure she’s cut out for either. When the museum curator who helped her find a replacement antique sap bucket is accused of murdering one of his employees, Nicole agrees to take the case as a way to decide at last which career path she’ll follow. If she can’t successfully argue his case in court, she’ll resign from a legal career for good. Unfortunately, the case turns out to be one of the most challenging she’s faced—from rare fatal diseases to a client whose defense is that he hallucinated a bear. The deeper she gets into the case, the more it seems everyone has a secret to keep. 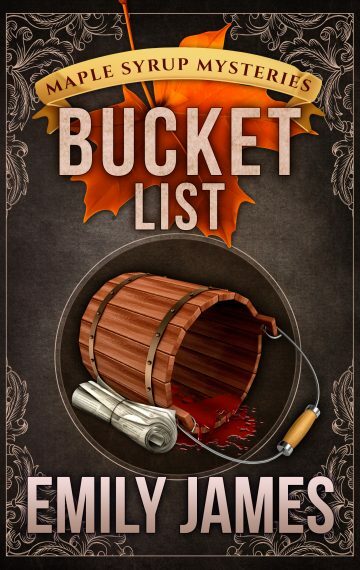 Bucket List is the eighth book in Emily James’ Maple Syrup Mysteries. If you love small-town settings, quirky characters, and a dollop of romance, then you’ll want to buy this amateur sleuth mystery series today!